Today I'm back with the final instalment in my gift guide series - if you've not already seen my advent calendar guide or my affordable Christmas gift guide then make sure you click through and have a read. But for now, here's my list of what to get anyone that you really want to spoil this year. I said in my affordable gift guide how much I love fragrance as a gift - it's one of those things that you can spend as much or as little as you like and it still makes a great gift. However, if you are looking to splash out on someone (or yourself) this Christmas, I can't recommend Lalique's Living highly enough. It's not too feminine, not too sweet, lasts all day, wears well so it's not sickly by the end of the day, and a tiny bit goes a long way - if you're struggling to find the perfect perfume then this is probably it - I haven't actually found anyone who doesn't like it yet, to the point that people have asked me on a train what perfume I used. It also comes in the most beautiful bottle (as you would expect from a company with it's roots in crystal) and incredible white and gold packaging; if anyone unwraps this on Christmas Day they'll be impressed before they've even smelt it. This genuinely might be my favourite gift of the entire gift guide series this year - I received this necklace in mid-November and I've worn it every day since! Merci Maman offer a beautiful range of hand-engraved jewellery to help you say thank you to the special person in your life. Merci Maman offer a range of necklaces and bracelets, from simple engraved disks to stars, hearts and gem stones. Honestly I would be over the moon to receive anything from them - you can personalise absolutely anything on the site, even down to what metal you'd like (I went for 18k gold). The jewellery is all incredibly high quality and even though it looks dainty it doesn't come with the "this might break any second" fear, because they're so well made. I always try to make a gift as thoughtful as possible because in my mind Christmas is a time where I can say thank you to my family, so being able to engrave your own message and customise it until it's perfect is amazing. When I bought my Apple Watch on a trip to Gibraltar, I liked the idea of being able to answer messages or phone calls and navigate without getting my phone out in central London (if you're based in the UK you've probably been warned about walking down Oxford Street on your phone), but I didn't realise quite how useful it would be until I started making an effort to get fit. My watch is much more accurate in step counting, but it also has workout modes that can track how you're doing, and it's particularly helpful if you're interested in running. I didn't buy it for the fitness aspects but I honestly don't know how I could exercise without it now. I realise £400 is a lot of money (I got mine cheaper as I bought it in Gibraltar) but there are some alternatives that do an okay job. I've not tried it but I've heard FitBits are great and under £200, but you could also try off-brand versions which aren't as accurate and a bit clunky to use but on a basic level work the same. If you know someone that's looking to track their exercise and is on the go a lot then I would absolutely recommend a smart watch this Christmas. I have to admit I was really struggling for a luxury "For Him" gift this year, so I went to the fountain of all knowledge, otherwise known as Dad. Having got the mansion, Porsche, and mentions of other expensive cars out of the way he eventually gave me something useful - a watch. In our house I have the designer handbag addiction, while Dad is all about the mid-range watches. Apparently this is an "indie" seller that only makes a few hundred of each model and you have to pre order months in advance which is awesome if you're organised, but I'm not. Instead I suggest having a look online at Selfridges or another luxury retailer and pick something that you could see the recipient wearing. In terms of price, it's kind of how long is a piece of string - whatever you want to spend there's going to be a watch at that budget. A watch makes the perfect gift because it's so customisable; you can choose their favourite colour, a style that you think would suit them, minimalist or a bit extra - it's one of those things that shows a lot of thought with minimal effort. I feel like home gifts are kind of impossible to buy someone - you never know their decor, if it'll match or if it's useful, so home fragrance is always a great bet. Candles or reed diffusers run out so there's always going to be a time that they'll need another, plus if you buy something subtle then they're probably going to like the smell and a plain candle can't really clash with the rest of their home. Until I found Heyland Whittle I would never be the person to spend £30+ on a candle - I'd tried others and didn't really understand the hype. However, these burn FOREVER! The candle was lit for an hour while I was taking these photos, plus all evening when we were watching a Christmas film and it's probably gone down about 3mm so it's clear it's going to last ages. I know a lot of people don't like the idea of a candle burning in case anything happens or they'd prefer to smell something all the time, so a reed diffuser is a great alternative. I love the Heyland Whittle ones because they're not too overpowering; sometimes you walk into a room and you get hit by the strong smell, whereas I prefer it to be subtle but you can smell it all the time - I've actually ended up buying a second diffuser for my Nan! One of the best things about Christmas is getting to see friends and family that you might not have seen for years; we always try to arrange something fun to do, especially on Christmas Day when we always try to have a game to play together. The Polaroid Snap Touch is perfect because it can be both a laugh and capture the moment. You can have a laugh by dressing up or making funny faces, but you can also use it to capture photos of everyone there. I've always loved the idea of instant cameras but the thing that's put me off is that I didn't want to waste film. The Polaroid offering fixes this with a memory card, meaning that when you take a photo it doesn't instantly print and you can go through and choose your favourite rather than wasting expensive film. You can also connect your phone via bluetooth to send it photos to print, meaning it doubles as both a camera and printer. Honestly I've secretly wanted an instant camera for a while but decided it was too expensive, but the Snap Touch is a much upgraded version of the traditional instant camera that I would absolutely recommend as the perfect Christmas gift. 2018 was the year that sustainability became cool, along with shaming anyone that didn't use a reusable cup until they caved into the pressure and bought one - I actually saw some cafes no longer offering disposable cups, so if you know someone that loves a coffee while they're going about their day, then this could be the perfect Christmas gift. I've seen a lot of brands trying to turn them into a fashion accessory, so if you know their favourite colours it'd be a great option to personalise it to their tastes. I've seen quite a few of the chain coffee shops offering a discount if you take a reusable cup, so in reality you're giving them the gift of cheaper coffee and the ability to enjoy their drink without being judged by everyone else - sounds perfect to me. I'm one of those people that loves to collect a souvenir from everywhere I visit - I love the fact that every time it catches my eye I'm reminded of a particular place or trip which leads me onto my idea for a stocking filler. Think about what's important to the person you're giving a gift to and try to find something that they can use to decorate their house with at Christmas - I found a cruise ship tree decoration which would be perfect for me! If you're struggling then just opt for something pretty that they can decorate with, and every time they look at it they'll remember you. My personal favourite this year is this beautiful winter candle from Stone Glow - it's made with gel that makes it clear, and the wick comes out of the chimney of one of the houses in the village at the bottom. It's something I've never seen before and I think it's beautiful! Having showed Mum and Dad we've decided we're going to have it on our table for Christmas lunch. This is one of those gifts that's not difficult to make personal, but it's one that they'll absolutely love. One thing I always struggle with when travelling is trying to find the perfect bag - when I have meetings in London I want something that looks smart but isn't too small, when I'm away for a few days on a press trip I need something big but not so it looks like I'm about to move in for good, and when I'm on a cruise, well, I just need the biggest suitcase I can possibly find! If you know someone that travels a lot, then buying them a new bag could be the perfect gift. In this day and age it's probably pretty easy to find out what kind of traveller they are from their social media, and from that you'll know what to get them. 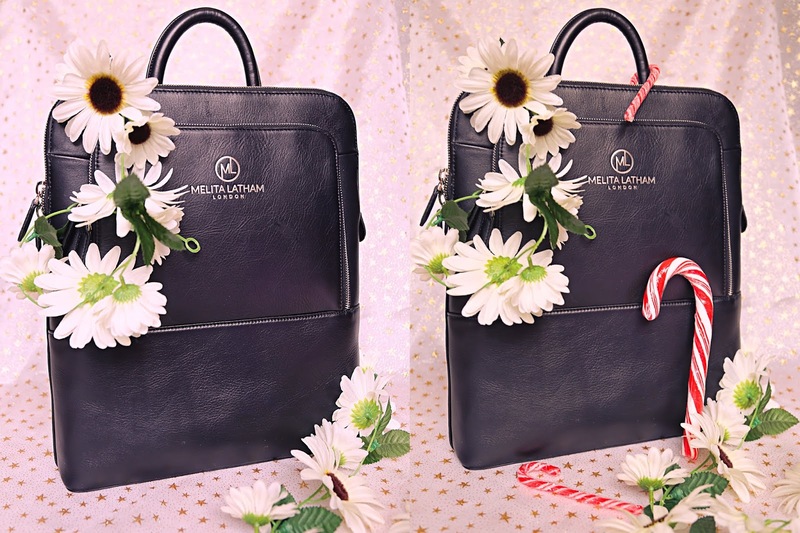 If you're looking for a business-appropriate bag and want to spoil the recipient, then I'd definitely recommend this bag by Melita Latham - it's kind of a backpack/laptop bag hybrid, so it's perfect if they do a lot of day trips or go to a lot of meetings. You could probably also fit a change of clothes in the main compartment if they're the kind of person that goes for a lot of overnight trips. While at first glance when I received this I thought "it doesn't seem that big" it's one of those great "Mary Poppins bags" where you can just keep putting things in and it disappears, although you probably couldn't get a lamp in there like the original. If you're looking for something to spoil a loved one that goes on a lot of business trips, then this is pretty much an ideal bag. Right, that's it for my 2018 guides - hopefully you've found something useful in them and it's given you inspiration for your shopping. Even just writing it has helped me decide what to get this year! From now on I'm going to be doing a mix of winter and Christmas themed content so it's not full-on-festive if you're not quite there yet, so make sure you come back for that and check out my Instagram if you're feeling festive.